Winners of the first ever America Recycles Day Billboard Contest were announced today at the City Hall in Dalton, Georgia. The 2010 contest was hosted by Target Recycling at School, a program managed by the Dalton-Whitfield Solid Waste Authority which supports recycling efforts in 35 schools in Whitfield County. Liz Swafford, Recycling and Education Program Coordinator, congratulated all the 6th, 7th, and 8th graders that participated. "Designing artwork for billboards is very different from creating a typical piece of artwork. Billboards are seen by people in moving vehicles and need to have a clear, concise message typically made up of six words or less." 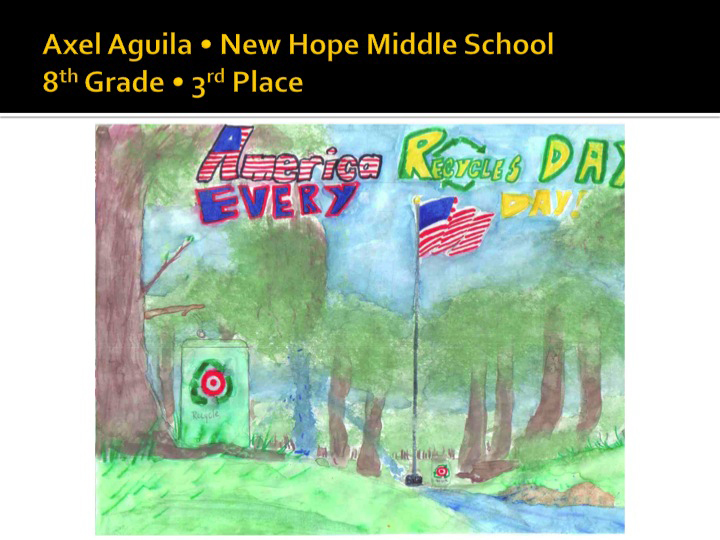 The winning design was created by Dalton Middle School 7th grader, Esmeralda Perez. Swafford added, "This year's billboard design simply states, "I will recycle" and "I Recycle" which is the America Recycles Day slogan." In addition to an overall winner, each grade also had a 1st, 2nd, and 3rd place winner. The nine students will be receiving goodie bags and a certificate of participation. The results and student's artwork are listed below. It will take about two to three weeks for the billboard to be made and revealed to the public. We will keep you informed and have an official unveiling date soon.